Happy Wednesday, my dear lovely readers! Today, I would like to focus on skincare, and on organic skincare, at that. The movement towards natural and organic has been strengthening more and more of late. I am not one to be not part of it. I especially love the idea of women becoming SME businesswomen, pursuing their passions. I dream of becoming such woman but for now, I would like to be a supporter to this movement first. Organic Alley is the brainchild of Aliw del Rosario, who's based in Baguio. Aliw is a strong advocate for beauty as a necessary pillar to a woman’s confidence, self-esteem, strength and personality. Beauty as a complement to one’s intelligence. Beauty as a gift that is our responsibility to protect and nurture. Beauty that goes beyond looks, emanates from the heart, and grows from good food, laughter with great friends and dare-devilish biking! Minimizes wrinkles, clears out blemishes, relieves patchy skin and revitalizes lackluster hair. Gave my skin serious softness, without the added hassle brought about by humidity. I do use this though indoors and before going to sleep. On top of using it as my moisturizer, I get to use a few drops on my hair as well, before swimming and before sleeping. Which makes it perfect for travel: It's a multipurpose product! No breakouts so far for two weeks now. 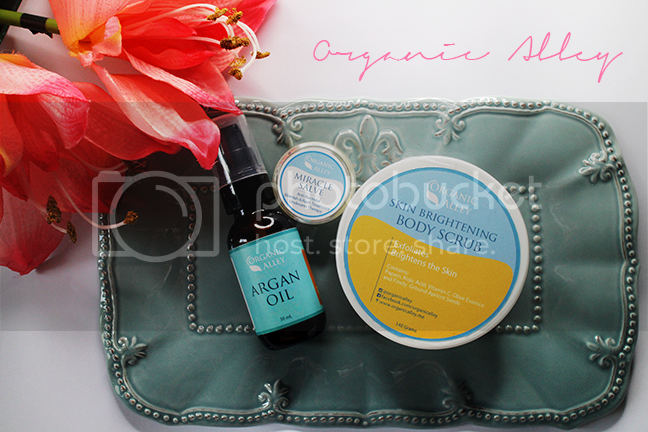 Organic Alley products are available online through Organic Alley's website.